If you’re searching for that amazing sound which takes all the pieces of pure musical roots and forms them into a perfect pop record then look no further than this new album by Norwegian all-female quartet Katzenjammer. Any doubts that a record with such an appealing instant hit will wither away is totally unfounded as ROCKLAND reveals a depth of eclecticism and comes up trumps in mastering the art of explorative ingenuity. Energy exerted in genre identification may be a sapping experience when coming to grips with this record as the four ladies kick hard in every direction imaginable, while pushing and pulling you on a memorable trip, which in particular will thrill alt-folk communities around the world. This is Katzenjammer’s third release since their 2008 debut which relatively soon followed the four members meeting up at music school three years earlier. The sum of Katzenjammer is made up of Anne Marit Bergheim, Turid Jorgensen, Solveig Heilo and Marianne Sveen, a combo showing no fear of instrument swapping, vocal exchange and full on musical experimentation. All this is done from an infinite roots base fusing banjo, a vast array of guitars, the band’s unofficial fifth member – a triangular contrabass balalaika, countless other unplugged implements making sounds and a dynamic beat driving the bulk of their up tempo output. Katzenjammer fit neatly between those two other Scandinavian exports ripping up the alt-scene, namely Baskery and First Aid Kit. Frequently they display the energy of the former and occasionally the guile of the latter. What is a mouth-watering prospect is catching their live show and the cream of their UK dates this year is a slot at the Cambridge Folk Festival. 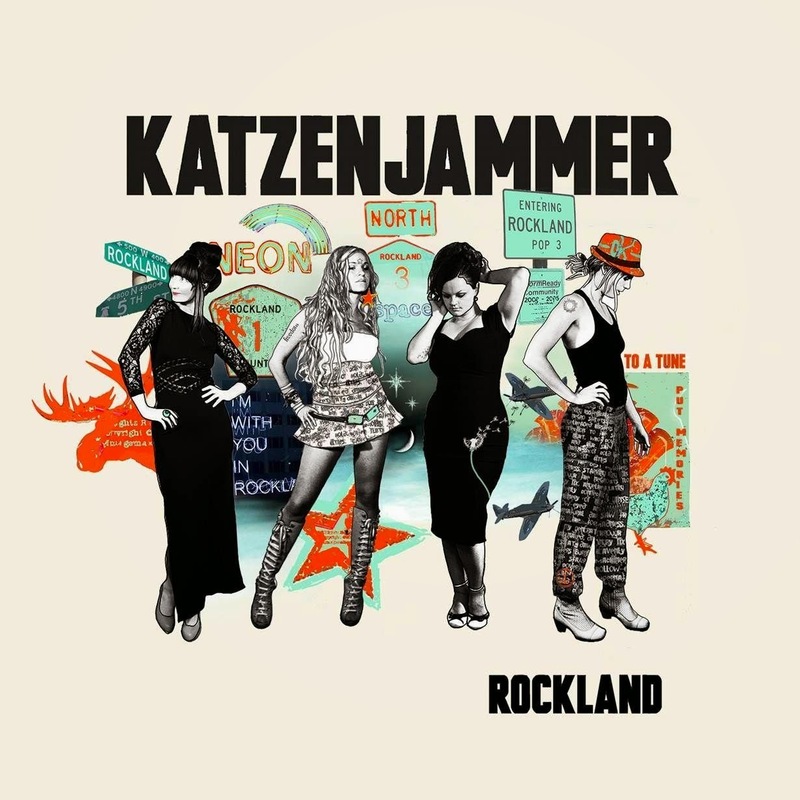 Katzenjammer has previously courted acclaim in this country with their earlier releases but ROCKLAND has the potential to raise eyebrows across the spectrum and most notably in the cool sector. The opening bars to the album’s introductory track ‘Old De Spain’ will excite the purists and that authenticity never leaves the ten other tracks even when the melodies saunter into extreme infectious mode. For some reason The Cure’s ‘Close to Me’ comes to mind in snippets of the album’s best track, the magnificent ‘Shine Like Neon Rays’, although playing both tracks side by side reveals the mind playing tricks. The punchy track ‘Oh My God’ is possibly the one to test the listener but ultimately it gets the seal of approval to make it a complete set from one to eleven. ‘Lady Grey’ is a natural selection to be the album’s lead track promotion-wise as it is perhaps the most conforming number on the record, yet still retaining an appetize-quenching appeal. ‘My Own Tune’ runs it close in the ingrained magnetic effect stakes aided by a first language segment reminding the listener of the band’s Norwegian roots. The way the lyrical structure flows and unfolds possibly exceeds the depth of literary analysis invited with the title track finale ‘Rockland’ being the exception, with the pace easing to unveil a beautiful tender piece exploring individuality and based on a poets experience within a psychiatric hospital. With a resultant rise in the eclectic stakes, ‘Driving After You’ throws a light touch of the blues into the mix, while a more explicit drive in contemporary folk direction exists in the wonderful and incredibly desirable ditty ‘My Dear’. The press release cites Joy Division and the Velvet Underground as the girls' inspiration for creative emotion and while it stretches your imagination relating this to the elements of pristine pop, the track ‘Flash in Dark’ possesses shades of moody indie. Of the two remaining tracks, the rootsy and raucous ‘Curvaceous Needs’ fits neatly into the album’s pacey opening section, while ‘Bad Girl’ is another example of a driving banjo number definitely in the Baskery mould. It may sound a touch conflicting to say the rule book has been discarded on a record awash with spectacular catchy melodies resembling material that gets gorged on by the masses but this record is almost like no other and delivers a powerful punch of genuine music in a truly satisfying way. ROCKLAND is an album to excite and Katzenjammer is a band to broaden your horizons with little risk attached.